Just done several quests, world bosses and some WvW and got an idea of a possible activity/mode: "PvEvP" or "PvEvPvE" (Have to find a better name), it basically oppose 2 camps/factions that can claim quests to fight the other camp/faction. It implies two opponents: "Allies" and "Foes" in the sense that a faction incarnate baddies and the other ones allied forces. The map itself is a giant fractal, once the cycle is finished, another one take its place, the opponents change. Everything reset. Players are put the most equally in the two camps, randomly. -Siege engines disappear after 10 mins if non-used, fortifications stay until destroyed. No squad can be created if the previous generated one isn't attributed anywhere. -The map outlook change every week, and the two implied factions too; resetting all progress. -Each quest is completed by everyone from your faction and progress slowly, 1% per action done. Repeatable 5 times, so 5 tiers for each quest. -Supplies used by Offensive and Defensive quests are ONLY produced by Support quests at a regular time interval once the 1st tier is reached. -Higher tiers unlock faster supply production, stronger weapons and defenses. Upgrading: By bringing supplies and depositing rhem in the camp storage once you are in the heart camp. Produce squad by speaking to recruiters and using an amount of supplies. 3 for tier I, 6 for tier 2, 12 for tier 3, 24 for tier 4 and 48 for tier 5. Upgrading: By bringing supplies there, like in WvW, gather an amount of supplies automatically added to the camp once you are in the heart camp. Produce squad by speaking to recruiters and using an amount of supplies. Same as before in offensive quest. Note: It produce blueprints, you need to invest then the regular amount of supplies of the corresponding siege weapon in WvW. Racial require 2x more than golems. Per Allied quest camp: 4 Veterans Guards, 4 fortification walls, 8 arrow carts or balistas, 3 catapults or trebuchets, 3 force fields or golems, 8 traps or mines, 1 racial weapon. Per Enemy quest camp: 4 Infiltration Squad, 4 Assault Squads, 2 Bomber teams. On the enemy HQ: 2 Demolition team and 2 Assault Squads. Each faction can place 25 fortification of any type maximum outside of camps. And 15 Veterans guards outside of camps. In the camp (veterans guard), at an enemy camp (Infiltration/assault/bomber) , at the enemy HQ (assault/demolition) or following you somewhere you need them. (veteran guards/bomber). Fortifications/siege engines are purchased using the supplies stored in the corresponding camp. Nobody have its amount of supplies, everyone use the camp one. Example map. 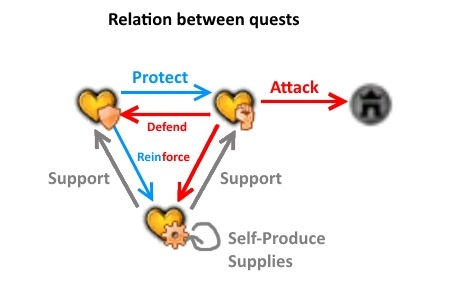 Gear = Support Quest, Shield = Defensive Quest, Fist = Offensive Quest. Castles = HQ. Blades= like in WvW, under siege. 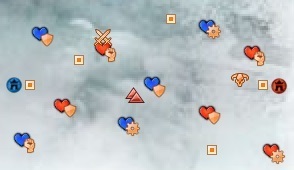 Boss Icon= Demolition team or Bomber squad. NOTE: The enemy can reclaim a quest by killing every NPCs within a quest camp, and knocking down the Quest NPC. The tier is conserved, but the affiliation is changed. Note: by opposition of other weapons, a player can ask them to follow him where he want, then you can switch back to attack mode, and use it like a regular WvW siege weapon. That's it, I don't have anything else to expose, it's just an idea and I concede, I don't have any faith in it, just wanted to share it there. Imo it would need some tweaks and many many works to be created/implemented, maybe wasted resources. It can be fun, rewarding each time you complete quests tiers, killing foes etc fractal relics and Skirmishes tickets. But again seriously, I don't know, and will accept any opinion as long as it point out solutions, issues or whatever aspect. So.... Fort Aspenwood? 'cause I'm totally down for that. Yeah, I was thinking that too - this sounds like 1 part WvW, 1 part Alliance Battles and 1 part Fort Aspenwood. It's an interesting concept, absolutely! I would play this mode.